Have you always wished that you had more space in your kitchen or wanted to update your cabinets and fixtures to better reflect your style and needs? If so, allow the skilled professionals at Star Home Remodeling to complete the kitchen renovation of your dreams. We can transform the kitchen in your Frisco, Texas, home into a more beautiful and practical space that will likely add to the overall value of your property. When you partner with Star Home Remodeling for your kitchen remodel, you can expect to receive top-notch services. In fact, our dedication to our customers and the high standard of work we produce has helped us earn a number of accolades throughout our years in business, including several Best of Houzz awards. We’ll begin your kitchen renovation process by meeting with you for a consultation at our showroom or your home to discuss what you envision for your new space. At this time, we’ll also provide you with as much information as possible about the products and design options available to help ensure you’re able to make the best decisions. Not only can we design and build the kitchen of your dreams, we can also custom-curate the best products for your style, needs, and budget. This can include custom flooring, cabinets, backsplash, kitchen islands, lighting, countertops, and so much more. 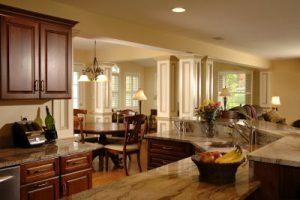 Contact Star Home Remodeling today for more information about the kitchen renovation services we offer to homeowners throughout the Frisco, TX, area. One of our friendly and knowledgeable customer service representatives will be happy to answer any questions you have.